Having taken ketchup and mayonnaise off the dining table at the Sunderland training ground, Paolo Di Canio did not reckon on the lions going straight to the CEO to bare their teeth. All of a sudden, Di Canio found himself on the menu. When they write the book on Di Canio’s 13-game Sunderland career, the rather short tome might well be entitled “Be careful what you wish for”. I’m not sure if Sunderland gave any thought to what they were getting when they appointed the colourful Roman. Building on Guttman’s theme, I would argue that successful managers broadly come in two styles. Either you want a lion tamer (Mourinho) or you want a surgeon (Wenger). Now Di Canio might not be most people’s first choice for operating on a loved one’s vital organs, but you’d give him good odds on bringing lions under control. The mad bugger would probably bite them back. Sunderland must have known they were hiring an emotional chap. This was a man who once sat down on the pitch and demanded for himself to be substituted after a succession of (legitimate) penalties appeals were turned down. A guy who spontaneously decided to join in a half marathon when he saw one go by. 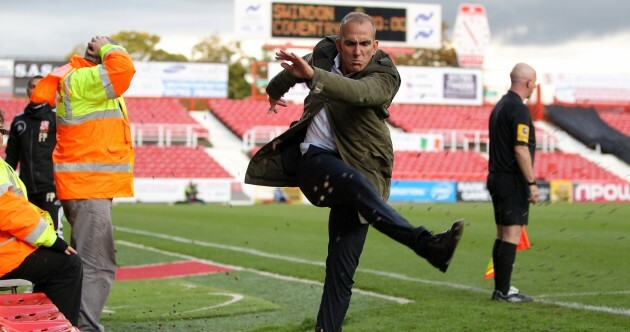 Di Canio did a great job at Swindon and he initially looked like he might do the trick at Sunderland too when he arrived, demolishing Newcastle 3-0 in his second game. Few could stifle a smile when, adorned in an expensive Italian suit, he went sliding on his knees to celebrate the second goal that sunk the Toon. There’s been little to celebrate since. Did the Sunderland board think all this emotion would simply disappear during the bad times? Watching Di Canio address the away fans last Saturday reminded me that managers used to enter into a much greater level of dialogue with fans. When Andrew (nee Andy) Cole was sold to rivals Manchester United for a British record £7million, Kevin Keegan personally addressed an angry mob of Newcastle fans remonstrating outside the stadium. That takes a lot of courage. At a fan’s forum in 1996, Harry Redknapp stared down a West Ham fan who opined that an 18 year old Frank Lampard (who was also present in the room at the time) wasn’t good enough to wear their claret and blue. ‘Arry told the fan in no uncertain terms that young Frank will go “right to the very top”. A bold statement to make of a chubby teenager still on the fringe of the first team. It didn’t look quite so foolhardy last month in Ukraine when Lampard picked up his one hundredth England cap. Now standing 20 yards away from your fans while muttering to yourself and pointing at your chin might sound like an odd way to communicate. But Di Canio saw the need to have some sort of dialogue with the supporters who, in his mind, he was employed of serve. They were angry and they deserved their moment to seek direct redress from the man in charge. In his words, a chance for him to “absorb their insults”. It didn’t matter to him that it looked strange. It mattered that he believed it to be the decent thing to do. I think the approach is an admirable one. You want to flagellate me? Fine, here’s a stick. People have a tendency to put too much emphasis on things being weird. They’re frightened by oddities. 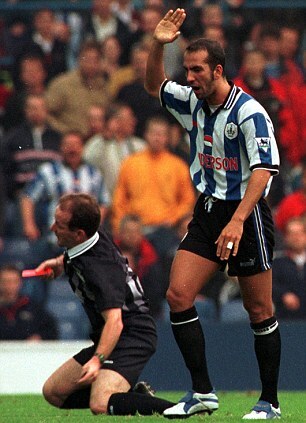 In the ensuing years, talking heads will remember Di Canio’s gesture as another golden moment of Football Madness. Third rate comedians with regional accents will pretend to remember the incident and describe it with lurid glee. People laughed at Phil Brown for conducting a half-time team talk on the pitch, forgetting that it had the desired effect. Having shipped four goals in the first period against Manchester City, Hull kept the score even for the remainder of the game. The facts didn’t stop Brown from being painted as the jester. They won’t save Di Canio either. Di Canio’s thought processes are not of the rational and calculated variety. He acts on feel and emotion. To my mind, it is incredibly obvious that he was a creative player rather than a defensive player purely by the way he acts off the pitch. His job as a footballer was to think when there was no time to think. Just to use creativity and instinct to survive. And he did it brilliantly. He did the same after the whistle last Saturday at the Hawthorns and was vilified. Whether or not you think this type of behaviour is appropriate as a manager, rather than a player, is a perfectly reasonable question. But if there is a single member of Sunderland’s board who did not expect something like this to happen with Paolo Di Canio in charge, then they ought to be fired for gross incompetence. This was exactly the sort of thing that Di Canio does. He knew the fans were angry and he saw two choices. He saw sloping off to the changing room and ignoring them. The cowardly option. Or he could address their anger. The gutsy and, in his mind, correct option. Famously, Di Canio has a sense of fair play. In the current instance, he was allowing the Sunderland faithful their right to fair comment. Unfortunately, Ellis Short just thought “Christ, what’s Paolo doing now?” and promptly fired him. Five games is not enough time for any manager. Di Canio had achieved his initial brief which was to keep Sunderland in the premier league. Having accomplished this, he ought to have then been given the time to mould the squad as he saw fit. Not suffer the indignity of a sacking even before the dying embers of the summer sunshine have been snuffed out. One point from a possible fifteen doesn’t make for nice reading. Although I suspect even the most optimistic Sunderland fan would struggle not to have foreseen at least one dismal patch this season. After all, they sold their only two good players during the summer; one of them going on to score for West Brom in the fateful game that was to be Di Canio’s last. An irony that ought not to be lost on the Sunderland board. Di Canio or not, Sunderland are going to get gored this season. He was right about the players – they’re not good enough. Getting rid of the conductor won’t make the orchestra play any better. Manish Bhasin is probably already reading up on the Black Cats for next year’s Championship highlights. Sunderland are going down. Sunderland executives were baffled as to where Di Canio’s spontaneous outbursts were coming from. Tags: Canio, Kevin Ball, Paolo Di Canio, Premier League, Stadium of Light, Sunderland, Sunderland A.F.C., West Bromwich Albion F.C.